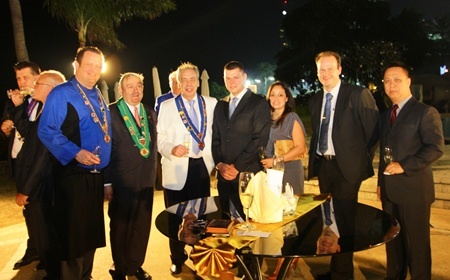 Members of the Chaîne des Rôtisseurs Bailliage Eastern Seaboard, led by Chancelier Peter Windgasse (3rd left), held their first get together dinner for 2015 themed ‘German Classics New Age’ at The Bay Restaurant of the Dusit Thani Pattaya. Conseiller Culinaire Jens Heier (left), also the hotel’s executive chef, created a seven-course menu for the guests. Guests included the hotel’s resident manager, Neoh Kean Boon (right), and fellow hoteliers Carl Duggan and Max Sieracki.